As two queens plot each other's destruction, a small band of adventurers continues its quest for the knowledge needed to defeat the mad King Brutus and his unearthly parasite, the Black Queen. Their search brings Morigan and the Wolf to the perilous forests of Alabion, where they and their companions will face the darkness of their pasts-and discover equally dark destinies. Meanwhile, far from Alabion, the queens of the East and West continue their deadly dance. One seeks a relic of great power, while the other puts her faith in a mix of military and technomagikal force. Both are aware they have a slim window of opportunity to settle their power struggle-after all, Mad Brutus's recent defeat is at best a setback. The mad king is already amassing a new army of soulless husks in the wastelands of Mor'Khul. Unknown to the great powers struggling for control, a father and son wander those same wastelands, scavenging what they can as they weather Brutus's gathering storm. They too have a role to play in Geadhain's fate-a role which may just provide a last remnant of hope. This fantasy novel that continues where Feast of Fates left off. Two queens trying to find a way to bring about each other's destruction and yet they both struggle to act quickly while the king is at a disadvantage and before his army can come into full power. Morigan and her blood-mate, the wolf, as well as the rest of the group have to travel down dangerous paths and through the darkness in the land of Alabion and they each must face very dark monsters and terrors and surviving will change them all. Love and family are the central themes of this novel. 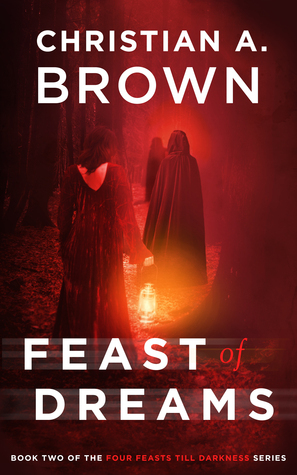 Feast of Dreams is a worthy sequel to the first book in this Four Feasts Till Darkness series. I cannot wait until the next book. A fantastic fantasy novel that continues where feast of fates leaves off. Although I'm not a huge reader of this type of book I was pleasantly surprised how much I enjoyed it.